Prior to WW2, the parish relied on wells for water, paraffin lamps for light, fires for heat and cess-pits for sewerage. The construction of RAF Chelveston was the catalyst for the "modern" utilities to arrive, as the airfield needed power, water and waste disposal in much greater quantities. The villages, however, were not connected to these "military" utilities and continued through the war years in the same manner as before. The Parish Council, as a Parochial Sanitary Committee, had responsibility for sewer provision. Prior to 1909, the public sewers ran down through the village to discharge into the main cesspit. In 1898 the Committee agreed to replace part of the sewer at a cost of £42 4s 2½d [£42.21] using best sewer pipes from W.J.Hilliyard of Thrapston (1s 5d [7p] per yard, delivered to site), with William Baxter providing the labour (1s 8½d [8p] per yard laid). Unfortunately this didn't prevent a typhoid outbreak in July 1899, probably due to contaminated water from the cess. Following a damming report from the County Medical Officer of Health in 1907, in 1909 the Committee awarded the contract to build a sewage treatment plant in Water Lane to Smith and Bunning of Kettering for £189. The Lord of the Manor Henry E D Wise agreed to lease the land to the Council for £1 pa for 21 years, plus compensation to the tenant farmer (Fred Brittin) of £1 10s [£1.50]. The "clean" discharge went into the Bidwell stream. In 1929, following reports of pollution of the stream, an investigation of the treatment plant revealed the filter beds were waterlogged and sick (ineffective), with standing water on their surface, and recommended replacement and changes to the layout. The lease of the land from Fred Brittin (due to expire on 8th April 1930) was renewed by Thrapston Rural District Council. In 1973-4 a new foul sewerage network was installed with greater capacity. The pipes were gravity fed down to a new pumping station built in Water Lane and then pumped over the intervening hill to a new, larger, sewerage treatment plant at Raunds, via a new 125mm PVC rising main. The old sewers then became the surface water (rain) sewers. The consulting engineers were Pick Everard, Kedy & Grimson and the contractor was Stamford Construction, whose final account was for £86,647.30. The pumps were supplied by Mono Pumps (Eng) Ltd for £5,116.03. 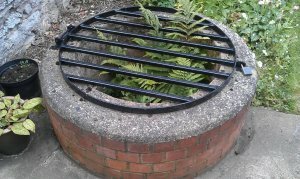 In 1982, continuing problems with the pumps breaking down and subsequent sewer overflow into Water Lane resulted in Anglian Water Authority agreeing to replace the pumps and fit locking lids to the sewer manholes to avoid escapes, at a cost of around £5,000. In June 1997 it was estimated it would cost £250,000 to provided a pumped sewer connection from the airfield housing annex (now Chelston Rise) to the foul sewers at Caldecott. Eventually a cheaper gravity fed foul sewer (9 inch) was installed and the old wartime airfield sewage treatment plant closed down. In 1899, the Parish Council was approached by the prospective Higham Ferrers Water Co. to see if it wished to be included in the private Act setting up the scheme. The Parish Council replied no, citing the parish had an abundant supply of water from the village wells! In 1905, the Parish Council decided another well was needed, to be built on the village green. The well was to be 5ft diameter and brick lined. James Morris won the contract at £5 19s [£5.95] with a further £5 spent on the pump. Samples were sent away for analysis and passed as fit for drinking. Currently known wells are at Middle Farmhouse (pictured above), the former Bakery, the old School House and the village green. In a letter to the Thrapston Rural District Council in 1924, the Parish Council reported the well pump on the Green required repairing. In 1932 it had again failed and required further repairs. 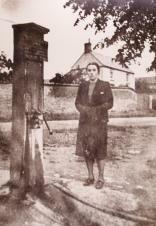 Mrs Mabel Meadows next to the well pump on the Green. In 1942 the pump had again failed and Mr Collis Baxter generously agreed to allow the villagers to use the well pump in his garden whilst the pump on the Green was repaired. It was agreed that when a new supply was laid into the Airfield later that year, that a standpipe would be provided in the village, so as to avoid reliance on the well pumps. Household mains water eventually arrived in 1946-7, via the Higham Ferrers and Rushden Water Board, and the pipework, laid in hand dug trenches, served for over 40 years, but in 1992, Anglian Water decided the number of bursts and the associated discoloured water meant it was time to replace it. Accordingly in August 1992, new plastic pipes were installed over the old mains and the service connections swapped over. The gas main was brought through the village during the later part of 1947, courtesy of the Rushden District Gas Company, just after the clean up had been completed from the installation of the water main. Bill Allan, the baker, had the gas installed to the bakery in 1948. As gas arrived before electricity, most properties changed over their lighting from oil lamps to gas lamps. Electricity was originally requested by the Parish Council in 1935, but was turned down by the Rushden and District Electric Supply Company Ltd, as they perceived there would be insufficient return on the investment. Electricity finally started arriving in 1949, and the old oil lamp used to light the centre of the village was finally replaced with the first electrical street light in May 1949, as the Rushden and District Electric Supply Company Ltd bid was cheaper than that of the Rushden District Gas Company. The installation of electric light in the church and an electric powered blower for the organ was celebrated in December 1952. By 1953, the Parish Council had entered into an agreement for Public Street Lighting with the East Midlands Electricity Board for the provision of 7 100w tungsten lamps to operate between 1st September - 1st April annually, from half an hour after sunset to 11pm, for the sum of £3 per lamp annually. In 1981, the East Midlands Electricity Board submitted an outline application for a 33KV/11KV substation adjacent to the USAF Housing Annex (now Chelston Rise), to serve the new HF Radio station being built on the former airfield site. The outline application was renewed in 1984. However, the site was never developed and the permission lapsed. In 1923 the Parish Council decided to board up the old parish Pound (originally built to lock up stray animals) at the bottom of Higham Hill, in order that old tins and rubbish might be deposited there, rather than left around the village. But in 1929 the Parish Council wrote to Mr Harry J.B.Mitchell, Secretary of the Chelveston Working Mens Club to advise him that the dumping of ashes in the old Pound was not allowable. In 1930 the Chelveston WI offered to provide some litter receptacles around the village. The Council agreed to accept the offer and made arrangements for their emptying. In 1934 the Parish Council contacted Thrapston Rural District Council to empty the old Pound, as it was now so full of old tins and waste, that it was spilling onto the Highway. The Parish Council appears to have conveniently overlooked that 11 years previously it had encouraged this practice! In 1938 the Oundle and Thrapston Rural District Council agreed to provide a monthly house refuse collection service in both Chelveston and Hargrave parishes, thus avoiding the need to use the old Pound as a central collecting point.